The PBM Guidelines have been developed following increasing evidence of transfusion-related adverse outcomes, leading to the emergence of new practices, including restrictive transfusion strategies and the increased use of alternatives to transfusion in the management of anaemia. An article published by ABC Health & Wellbeing on why experts are rethinking blood transfusions refers to just some of the literature showing that optimising a patient’s blood prior to a procedure results in improved patient outcomes. The guidelines are based on a systematic review of all available evidence. Eminent clinical experts from all relevant disciplines were involved in the development of the clinical aspects of the guidelines. The guidelines were subject to an exhaustive national clinical peer review process. An independent contracted systematic review team conducted the research and technical writing. An independent systematic review expert reviewed the modules at different stages of its development. An independent AGREE II reviewer assessed the guidelines prior to being submitted to the National Health and Medical Research Council (NHMRC). The guidelines were subjected to a comprehensive public consultation process. The guideline development process, including consumer representation, was independently reviewed by the NHMRC. The guidelines are formally endorsed by Australian, Australasian and New Zealand colleges and societies. Recommendations are based on evidence from the systematic review and are carefully worded and graded to reflect the strength of the body of evidence. Where there is insufficient quality or quantity of evidence, it is not possible to develop evidence‑based recommendations. In this situation, practice points are developed by the Clinical/Consumer Reference Group through a consensus-based process, to guide clinical practice. Where relevant guidance that was outside of the scope of the systematic review is required, consensus-based expert opinion points are developed. Guiding principles and values, and ‘ground rules’ are established to ensure the consensus is in line with current clinical practices. 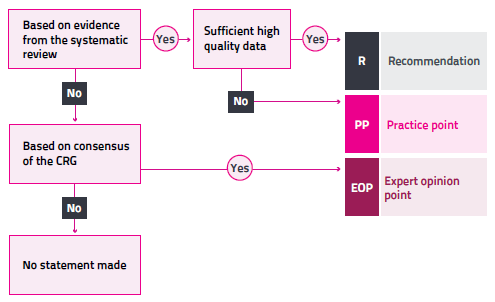 The rationale for developing recommendations, practice points and expert opinion points is depicted below. The review and update of the PBM Guidelines will continue to be underpinned by a robust and transparent process. 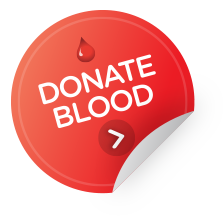 Further information on the update process can be found at Patient Blood Management Guidelines Progress Updates.